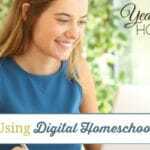 When I first heard about digital homeschool curriculum, I couldn’t imagine using it in our home. I love books. The turning of pages is magical, it makes me happy. It was more than that though. 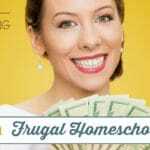 I’m a frugal homeschool mom and I knew that printing everything would cost a fortune. So, I didn’t even give digital homeschool curriculum the time of day. Until…my children became interested in learning about things I didn’t have resources for in our home. The library is by far my first choice for learning about new things, but many times we couldn’t find what were looking for. 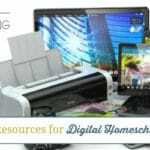 So, I began looking into homeschool resources online and discovered that there were SO many more topics and subjects covered in digital homeschool curriculum than in textbooks. If I could change anything about how we use digital homeschool curriculum in our family, it would only be that I wish we’d gotten started with digital homeschool curriculum before! We first started using digital homeschool curriculum when we began our journey toward child led homeschooling. My children have created lapbooks about the Vikings, learned valuable life skills, discovered the true history of Valentine’s Day, completed movies and literature studies, studied women artists, taken an Ancient Egypt course and much, much more! The beauty of each of those studies I mentioned? Only 1 of them required that I print anything! Many of the digital homeschool curriculum available doesn’t actually have to be printed. Students can read their lessons on their portable device or computer. Some courses even have the ability for the student to type in their answers. If that option isn’t available in the digital homeschool curriculum you’re using, you can pick up a notebook at the dollar store or use a 3 ring binder and have you student complete the Q&A on paper. Currently I am out of bookshelf space. I don’t have room for any more homeschool curriculum or any new books for that matter in my home. For a homeschool mom that is a problem. I’ve learned that by using digital homeschool curriculum I don’t have to spend money on new, bigger bookshelves for my home. Often times there is a draft print mode or a black and white only option on printers. By selecting either of these options you’ll ensure that you’re using the most frugal ink option available for printing the digital homeschool curriculum you need to have on hand for your homeschool lessons. In our garage there are several (I honestly don’t know how many) totes full of old homeschool curriculum and my children’s’ schoolwork. While I love knowing about all of the memories that I have in those totes, I know that some day I will likely end up tossing a lot of it once they’ve graduated. Using digital homeschool curriculum allows me to save the special hands-on projects and papers from our homeschooling journey, which saves me money on purchasing totes. Let’s face it, kids can be hard on books. When you have multiple kids to homeschool, you want to be able to reuse what you can. You don’t want to have to buy something you’ve already paid for before. Digital homeschool curriculum doesn’t get torn pages, juice stains or busted up covers. When you’re ready to teach the next student, just open up the file and it looks just like it did the first day you opened it! Homeschooling frugally is important to me. I will not sacrifice my children’s education just to save a dime, but I don’t want to waste money either. I desire to teach my children to be good stewards of all they have and to use money wisely. The best way to do that? To show them how it is done. Remember the saying, “You can talk the talk, but can you walk the walk?”. It applies to everything we teach our children throughout their lives. We can tell them anything we want to, but the point is driven home when we show that we can do what we’re telling them. 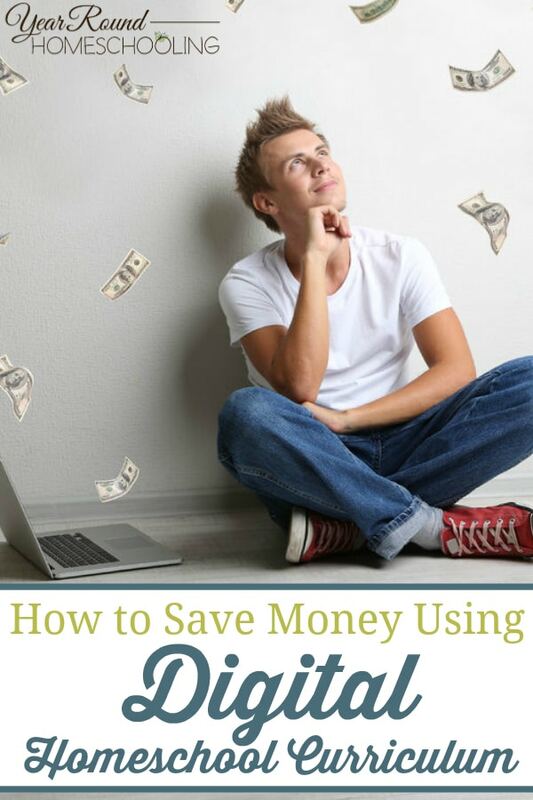 How do you save money using digital homeschool curriculum in your homeschool?